Yesterday we received our advance copy of This is the Sea 4, Justine Curgenven's anxiously awaited sequel to the sequel of the sequel of This is the Sea. Consider her the J.K.Rowling of the paddling world, with lots of great characters, loads of adventure, plenty of magic, but less of the teenage angst. We watched disk one last night and will watch disk two tonight after the Chicago Whitewater Association pool session, so if you were hoping to hear what we think, check back tomorrow. 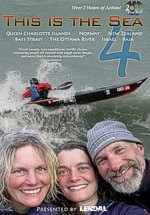 Meanwhile, call Geneva Kayak Center at 630.232.0320 to reserve your tickets to her Nov. 14 midwest premiere.